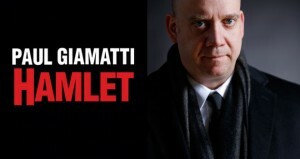 It’s worth saying right from the start that Paul Giamatti, who’s a year younger than me, is too old to play Hamlet. But he gives the role a clownish mania and stoop-shouldered charisma, particularly when traipsing around in bathrobe and boxers in act 2. It’s a smart, oddly withdrawn performance, a Hamlet that, almost to the end, hides himself in private cloaks of inky black. I don’t like to see film stars big-footing stage actors, but this was an engaging production. In what I recognize now as a revealing moment but which startled me at the time, I didn’t even notice Giamatti’s presence in 1.2 until he slowly slouched across the front of the stage during one of Claudius’s political speeches. Avoiding eye contact throughout, Hamlet played his outsider role with man-child petulance. When there were crowds, he was on the margins. His antic disposition, in this production, meant boxers and bathrobe, and it was in the comic scenes, with his un-Hollywood belly poking out beneath his undershirt, that Giamatti filled out the role. Clownishness surfaced in unexpected places: when playing hide-and-go-swear with the Ghost (1.5), when mocking Rozencrantz and Guildenstern, when leaping into the arms of a stunned Horatio. This Hamlet was the prince as clown. We know Hamlet’s obsessed with performance, and this production made an interesting decision to have the players yawn during his acting lecture (3.1). It was an interesting push back against the canonical force and supposed wisdom of this role. “Suit the action to the word, and the word to the action,” intones the rich man who’s just ordered his own private play. 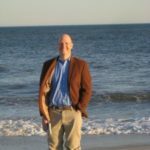 He sounds like no one more than…Polonius. Speaking of garrulous old fathers, Gerry Bamman as Polonius gave the great performance of the night. In a role the invites ridicule, he was plump but also stately. Dragging out with sophomoric wordplay his theory about the cause of Hamlet’s madness, he seemed foolish but powerful, and the King and Queen deferred to his wisdom and authority. Every scene in which he appeared was both funny and touching, perhaps partly because his part is so strongly colored by his early accidental death, but also because of the sense, which I’ve never felt so strongly before, that really he was the man Hamlet should have grown up to be. Wordy, clownish but also kind, well-read if pompous: really the ideal father in law for our grad student prince. As the tie that might have bound prince Hamlet to Polonius, Yale Drama school graduate Brooke Parks struggled to span the gap between youthful beauty and Giamatti. She clearly attracted the eye of King Claudius, played with force and physical charisma by Marc Kudisch, but it was hard to believe in the back-story romance between her and Hamlet, doggerel love letters notwithstanding. 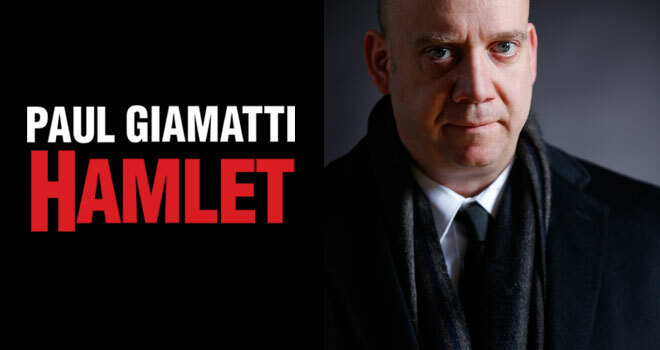 At the end of the day, though, it’s a play about a prince, and with Polonius killed just after the interval, Giamatti’s Hamlet had to carry the day. I was worried about how convincingly he could duel agile young Laertes, especially after he garbled his lines upon attacking him at Ophelia’s grave. “Woo’t weep? Woo’t fight? …Drink up eisel? Eat a crocodile?” he raged, though the production, as part of a not too intrusive, but noticeable, effort to simplify the language, replaced “eisel” with “vinegar.” Hamlet’s fighting spirit in act 5 appeared at odds with his early reticence. Giamatti did quite well with the famous soliloquies and hackneyed lines such as “poor Yorick” because he skillfully presented the reluctant emergence of a private man’s emotional core. But when he eagerly dueled a much younger opponent, and clownishly scored one hit between Laertes’s legs, he became something else. “I am dead, Horatio,” says the prince twice in one of my favorite lines from the play. At this point, Giamatti’s projection of privacy returns, as death facilitates a final withdrawal from an unwanted public. “The rest is silence,” in this production, was a self-conscious line; it aimed for, and got, a final laugh. I’ve not seen it done that way before, but I liked it. There’s a way that Giamatti’s local history makes him a prodigal prince returning: a Yale and Yale Drama school grad, Paul Giamatti is also the son of a heroic father, who was the last early modern literature scholar to head Yale and the only one, to my knowledge, that’s ever run Major League Baseball, martyr to Pete Rose, and perhaps as difficult to live up to as warrior Hamlet himself. The guy sitting next to me was at the show as part of a class of 1950-something high school reunion event, and I felt a lot of New Haven history in the building. The best literature is always a take: there is an implicit risk in its execution, a margin of danger that is the pleasure of the flight, of the love, carrying with it a tangible loss but also a total engagement that, on another level, lends the theater its unparalleled imperfection faced with the perfection of film. 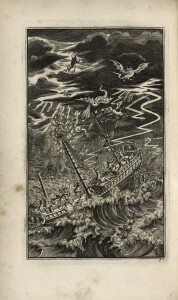 Here’s a cover image of The Tempest from a 1707 ed of Shakespeare’s Works that I used in the opening case of the Folger show last summer. 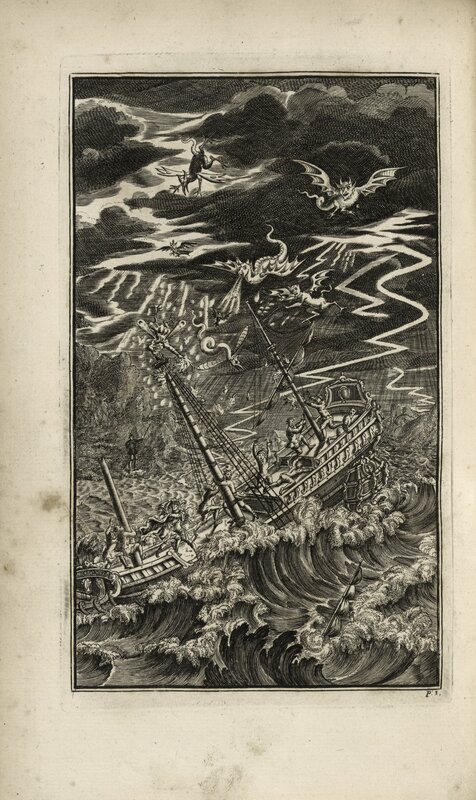 If you look at the terror on the faces of the mariners, the demonic glee of Ariel in the clouds, & the bemused unconcern of Prospero on shore (hard to see on the left hand side), it’s a pretty good image of grad school in English. Please comment below & read this image back for me: do you see a different allegory, of teaching or learning or something else?